Nicole Silva is one of those special people who figured out early in life what she wanted to do, and then did it. She was in second grade when she realized that she wanted to be a teacher. In fifth grade, she would pretend to teach classes at home. Her parents even bought her a globe so she could show her “students” what the world looked like. Today, after winning $25,000 in the 2018 Milken Educator Awards, Silva still has her parents’ globe in her third-grade classroom at the Nathan Hale Elementary School in Carteret. She always knew what she wanted, but she’s not stuck in the past. She does things like helping her students explore the planet by using Google Expeditions, a virtual reality program that excites kids in a way that a spinning globe never could. During the last Olympic Games, she taught her students about the games in ancient Greece by building multiple units around an Olympics-themed book in the “Magic Tree House” series. Students researched the original competitions, comparing them to modern times, wrote newspaper-style articles arguing for the inclusion of women, and created their own games using recycled materials. Always looking for hands-on activities that connect academics to real life, Silva set up a miniature basketball hoop during a math lesson. Students recorded her statistics and used fractions to represent her score-to-miss ratio. 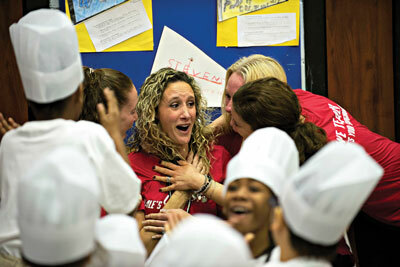 Last year about 40 educators in the U.S. received the Milken award, called the “Oscars of Teaching” by Teacher magazine. Silva’s award was announced in December, during a surprise assembly in the school. New Jersey Education Commissioner Lamont Repollet and Carteret Superintendent Rosa Diaz named Silva as their honoree to raucous cheers from her students. Officials tape-recorded the conversation when Silva told her mother, Elaine Gasparro, about the award. Her mother cried. “My mom and dad have always been so supportive of me,” Silva said in a telephone interview. Her father, Joseph Gasparro, is a member of the Carteret Board of Education. She says she is astonished by the $25,000 award, which she can spend in any way she chooses. She plans to repay her student loans, and may also use some of the money to help develop a story she wrote years ago. “I wrote it with my students in mind. It’s about how everyone has a talent, and how everyone is special in their own way, she said. Nicole Silva reacts to the news that she is the 2018 Milken Educator Award winner.